Showing all 36 items matching your search criteria. 202. 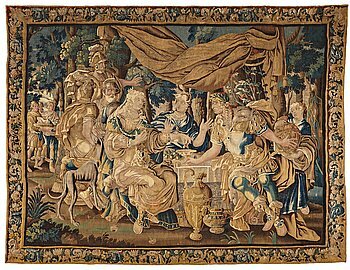 A TAPESTRY, "Cleopatra´s banquet", tapestry weave, ca 281,5 x 370 cm, Flanders 17th century. 203. 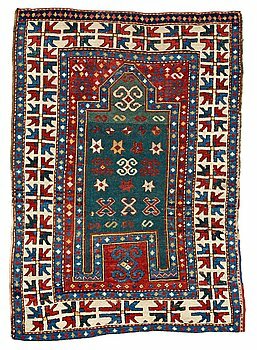 A CARPET, an antique Bakshaish, ca 693 x 398,5 cm, dated "1298"AH/1880 AD probably. 204. A CARPET, an old Baotou figural, China, ca 162,5 x 233,5 cm. 205. 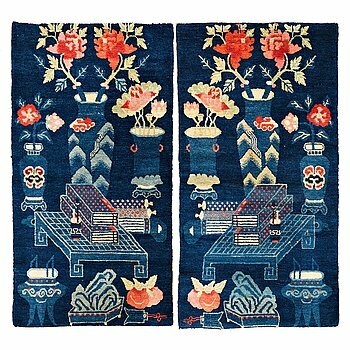 RUGS, 1 pair, old/semi-antique Baotou, China, ca 135 x 71,5 cm each. 206. A RUG, an antique Beijing Qing probably, China, ca 193 x 156 cm. 207. A RUG, an antique Fachralo Kazak, ca 149 x 104,5 cm. 208. A CARPET, a semi-antique Heriz/Gorovan, ca 441,5 x 356,5 cm. 209. A CARPET, an antique Esfahan, ca 480,5 x 350 cm. 210. 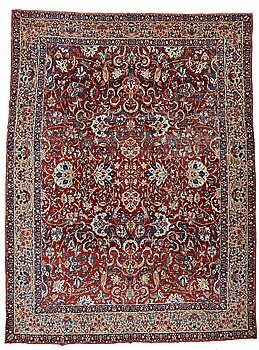 A CARPET, a semi-antique Esfahan/Nain, ca 250 x 169,5 cm (as well as the ends have 2 cm flat weave). 211. A CARPET, a semi-antique Esfahan, ca 227 x 152,5 cm (as well as the ends with ca 1½ and ½ cm flat weave). 212. A CARPET, a semi-antique/old Esfahan/Nain part silk, ca 232,5 x 137,5 cm (as well as one end with ca 1 cm flat weave). 213. A RUG, an antique Karachop Kazak, ca 213 x 166 cm. 214. 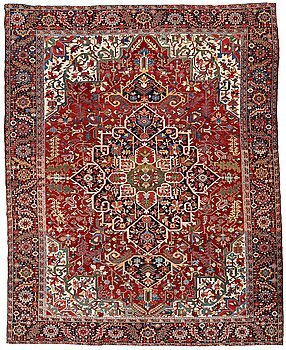 A CARPET, a semi-antique Qashqai, ca 265,5-268 x 169,5-171 cm (as well as one end with 2 cm flat weave). 215. A RUG, a semi-antique silk Kashan relief (souf), ca 202 x 130,5-133 cm. 216. 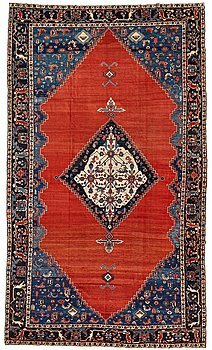 A RUG, a semi-antique Kashan, ca 210 x 129,5-134 cm. 217. MEDITATION RUGS, 1 pair, old/semi-antique China, ca 199 x 73,5 and 200,5 x 71,5 cm. 218. A CARPET, an antique Kerman Laver, ca 363 x 301 cm. 219. A RUG, a semi-antique Anatolian tülü, probably Konya, ca 218,5 x 140 cm (plus the ends have 7 and 4 cm flat weave). 220. A RUNNER, an antique Kuba, ca 289,5 x 97 cm (as well as the ends with 1 cm light blue soumak). 221. A RUG, an antique Malajir probably, ca 179,5 x 124 cm (as well as one end with 2½ cm flat weave). 222. A RUG, an antique Marasali prayer rug, 19th century, ca 151 x 119 cm. 223. 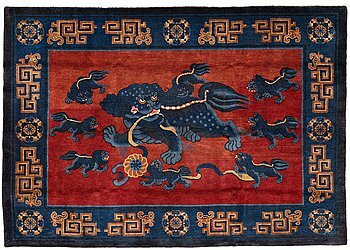 A PILLAR CARPET, an antique Ningxia figural, China late Qing, ca 304 x 130-170 cm. 224. A MEDITATION CARPET, fourteen squares, an antique Ningxia, China late Qing, ca 822 x 60 cm. 225. A CARPET, an antique/semi-antique Shirvan, ca 234 x 130 cm (as well as the ends with 1 cm flat weave). 226. 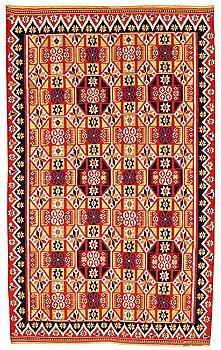 A RUNNER, an antique TALISH, ca 264,5 x 115 cm. 227. A RUG, an antique silk Tabriz, ca 165 x 118,5-111,5 cm. 228. A CARPET, a semi-antique Tabriz Ghannadi, ca 424,5 x 321,5 cm. 229. A CARPET, a semi-antique/old Veramin, ca 353 x 213,5-215,5 cm. 230. 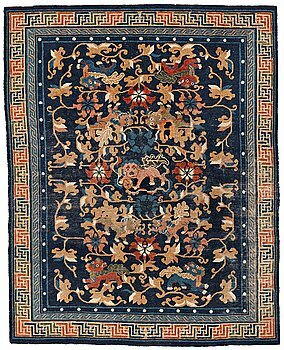 A CARPET, a semi-antique Veramin, ca 307-310 x 202,5-206 cm. 231. Märta Måås-Fjetterström, A CARPET, "Röd Flossa", knotted pile, ca 306 x 267,5 cm, signed AB MMF. 232. Barbro Nilsson, A CARPET, "Snäckorna", flat weave, ca 344 x 248,5 cm, signed AB MMF BN. 233. Barbro Nilsson, A CARPET, "Falurutan, Duhs", flat weave, ca 408 x 225,5 cm, signed AB MMF BN. 234. Barbro Nilsson, A CARPET, "Falurutan, Duhs", flat weave, ca 220,5 x 146,5 cm, signed AB MMF BN. 235. Barbro Nilsson, A CARPET, "Rödarp", flat weave, ca 299 x 186,5 cm, signed AB MMF BN. 236. A CARPET, flat weave, ca 219 x 189 cm, signed KLH VN (Kristianstad läns hemslöjd, Veronica Nygren).